Named for the original owner and builder of Ship's Light, the Prince Harding apartment is a one-room studio, with a kitchenette, bath with shower and lovely front porch. Airy and light, this apartment has been updated in 2017. The main room includes a queen-sized, four-poster bed, dining table & chairs, comfortable seating area and flat screen TV with cable. Wireless internet service is available throughout the house. Perfect for a couple, the kitchenette has an apartment-sized range, microwave and refrigerator with freezer. Enjoy your morning coffee on the private front porch with your loved one or watch the sunset while sipping a glass of wine. The charm of the apartment is further enhanced by the warm glow of beautifully refinished, wide pine, antique floors. 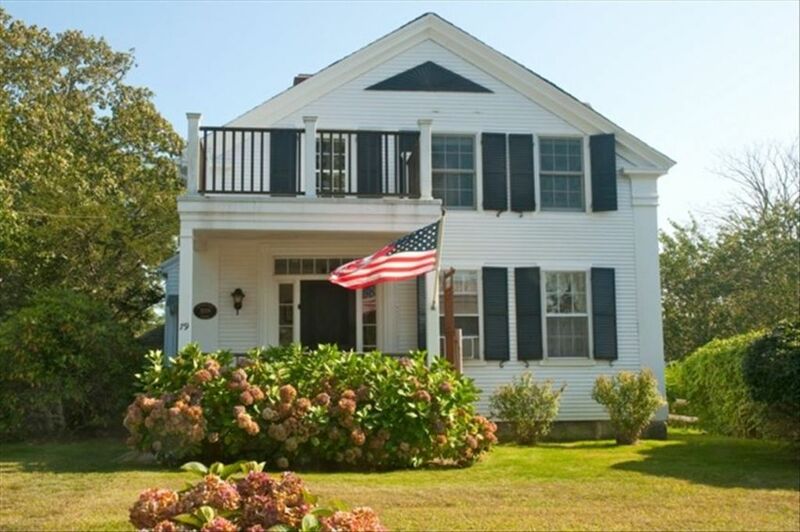 Centrally located within a short walking distance of excellent Chatham dining, shopping, movies and band concerts, the house is three blocks from the town salt water beach on Oyster Pond, and one mile from Coast Guard Beach, a great stretch of Atlantic Ocean and dunes. Many individuals, couples and extended families consider Ship’s Light their vacation home. We invite you to join them in making your vacation something special. The Prince Harding apartment at Ship’s Light is rented for minimum 3 night stays during the summer and for minimum two night stays during the shoulder and off-seasons. Other units with unique features are also available and the whole house can be rented as a 5-to-6 bedroom home for family gatherings. The Coleman family has owned and loved Ship's Light since the mid-1970s. Like several owners before her, Lena Coleman lived at Ship’s Light year-round and rented its apartments to summer visitors. After she passed away, Bill, Roz and Allison Coleman undertook successive renovations and updates to the property, continuing to rent it during the summers to long-time friends and new guests. It has been a labor of love to work on this lovely house over the decades and it evokes in us strong memories of the generations that have come before us; in their honor, we have named each apartment. Lena, like others before her, looked forward to the summers when her long-time renters would return to visit, bringing with them stories of their winter months and great friendships built over many years; we are proud to continue this hospitable tradition in the heart of Chatham. Located on a quiet street just off Main Street, Ship's Light is perfectly located and convenient to everything. You can walk downtown to shop in Chatham's great stores, enjoy a meal at a great restaurant, get ice cream, see a movie at the recently-restored Orpheum Theater and attend Friday night Band Concerts; it's a short walk to the public library and Methodist, Episcopal and Congregational churches; other churches also nearby. Chase Park and the grist mill are right around the corner; Oyster Pond (a nice swimming beach) is a short 1/4 mile stroll; the Atlantic Ocean is about 1 mile away. Visitors love to sit and read on the porches and decks overlooking Cross Street and Shattuck Place; from these private perches you can put your feet up and watch the world go by. 2-block walk to the middle of downtown Chatham; near restaurants, the library, movie theater and shops. Large front and side yard. Washing machine and dryer available for renters in the garage. Off-street parking with room for bicycle, kayak and canoe storage in the garage. Great location near town! Perfect for a couples getaway and very affordable! Historic...reminding me of my grandma’s house! Nice! Clean , ideally located for local interests in Chatham . Free parking on site , lots of hot water . Our particular apartment was very small, dated and cramped . If you are staying prepare by taking all foodstuffs as none provided. Good laundry facilities in the garage but must take own detergents as not provided . Accommodation was pretty basic and if the rest of the house is occupied prepare to inadvertently hear other residents’ conversations !! Bathroom and kitchen in need of serious overhaul. These guests clearly do not understand the difference between a bed and breakfast and an apartment rental. They left us a note suggesting that we provide breakfast items, local produce and wine! They also would prefer that we take on a number of unrealistic renovations that would ruin the historic character of the house--including enlarging the bathroom and kitchen! The apartment is as described and pictured. Many guests find it a charming, comfortable launch-pad for enjoying all that Chatham has to offer. People who want a large, modern suite in a bed and breakfast should rent that elsewhere. Location was great but the apartment was rather shabby. The proximity to town and Oyster Pond was wonderful and we enjoyed walking to both many times. However the apartment was a great disappointment. Other than the new curtains and shades most everything was well worn. The bathroom and kitchen were extremely small but we knew that from other reviews. The worse thing was the musty oder in the room and the closet. We bought an air freshener and that helped. Would definitely not stay here again. Clearly, smells are in the nose of the beholder! When these renters left, all the windows were closed and the apartment was permeated with a terrible fishy odor, "masked" by awful air freshener. We opened the windows and aired it out, which took care of the smell. The lesson is: if you don't like the smell, open the windows! This is the Cape; in the Fall, when we close the windows, it can sometimes get stuffy--opening the windows for a few minutes usually does the trick. These renters apparently wanted everything new; we work hard to maintain the house and to decorate it appropriately. If you want a new, modern unit, an antique home is probably not the best choice for you. A nice location if you like being close to town. Could use a few upgrades at very little cost, which would make a world of difference. Enjoyed our stay in the Prince Harding apartment. It was very comfortable, convenient to downtown and had everything we needed.